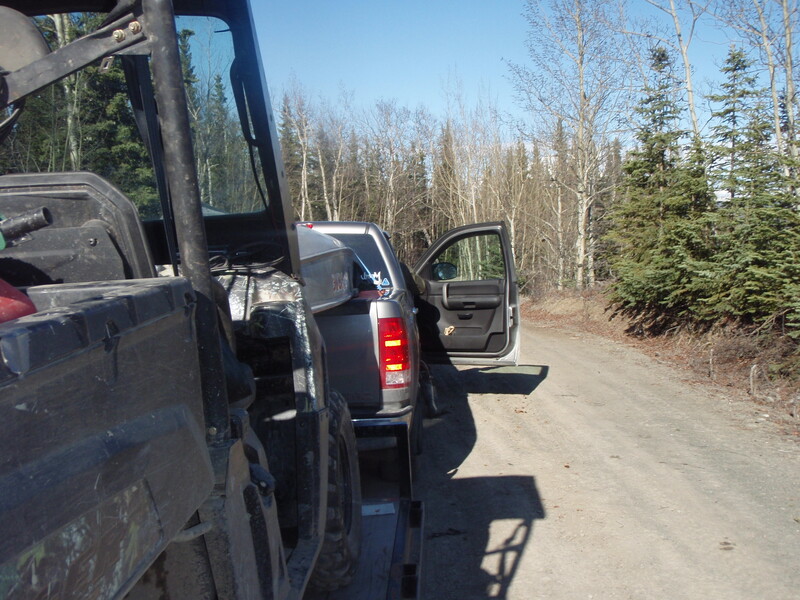 Here we go again, yet another spring bear season has come upon the eagerly waiting outdoorsmen. The blossoming green leaves and the winter now melt, once again giving hunters the chance to explode out of our winter dens (the couch) and into another beasts den. This year I chose non-proven hunting grounds in an attempt to correct a previous strikeout in the same hunting area exactly one year prior. 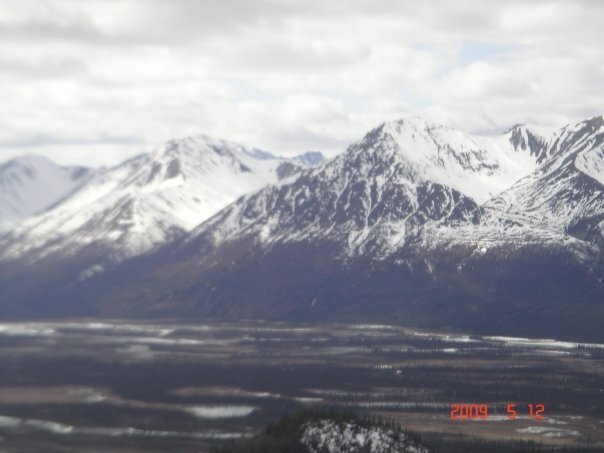 I would be returning to a hunting location Jon Dykes and I had researched and found prior to the 2010 fall hunting season, a location containing both black and grizzly bears. The focus this year was a black bear with a muzzle loader and a grizzly bear with a longbow, a quest that will follow me through out my able hunting life. This hunt was a non-guided, public land do-it-yourself, over the counter tag successful spot and stalk style adventure. This article will outline the success and failures of this style of hunt, a hunt within budget reach of millions of American outdoorsmen nation wide. After three years of hard work and research, the goal of developing a premium bear hunting location in Alaska seemed within reach. The spring hunt ended with a succesful black bear harvest but unsuccesful grizzly bear harvest. The 2010 spring hunting season ended abruptly after having blown not one but two stalks on grizzly and black bears respectively. Spending 6 months searching for a location, contacting fish and game biologist, asking about and studying features of topographic maps helped to locate bears. Harvesting one of these bears with stick and string is a completely different story. 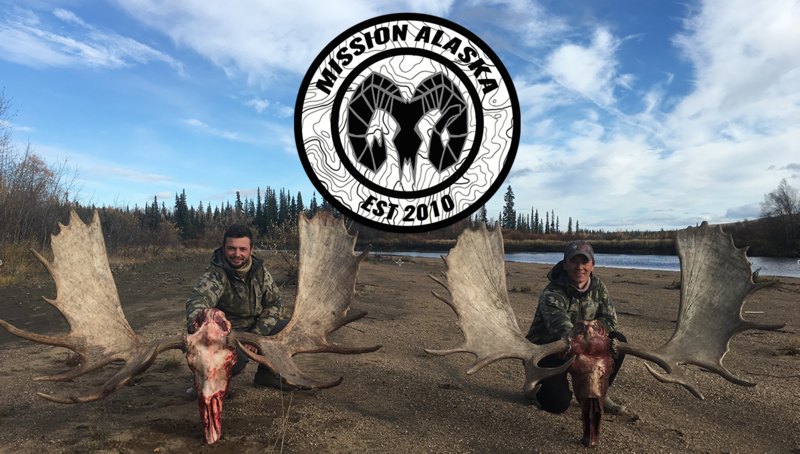 Jon Dykes and I once again began discussing hunt details of our upcoming Alaska bear hunt, during the final semester of our Penn State University student career. We decided we must find a new location that will consitantly produce huntable bears, year after year. The goal was simple, but hardwork and research would be the determinants of our objective. Once the objectives were settled, the mission began, Jon and I left Penn State and headed to Alaska to begin the quest set out before us. 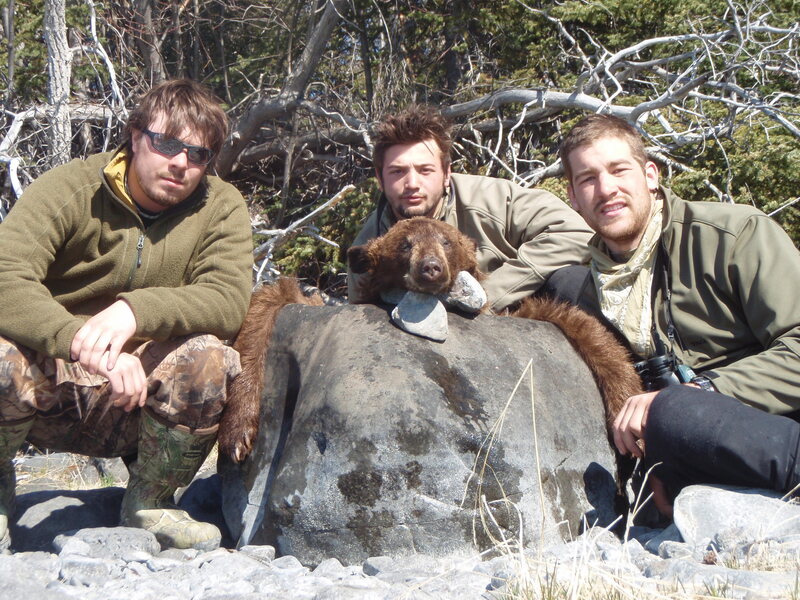 The Mission: Develop a premium public land bear hunting destination in Alaska. 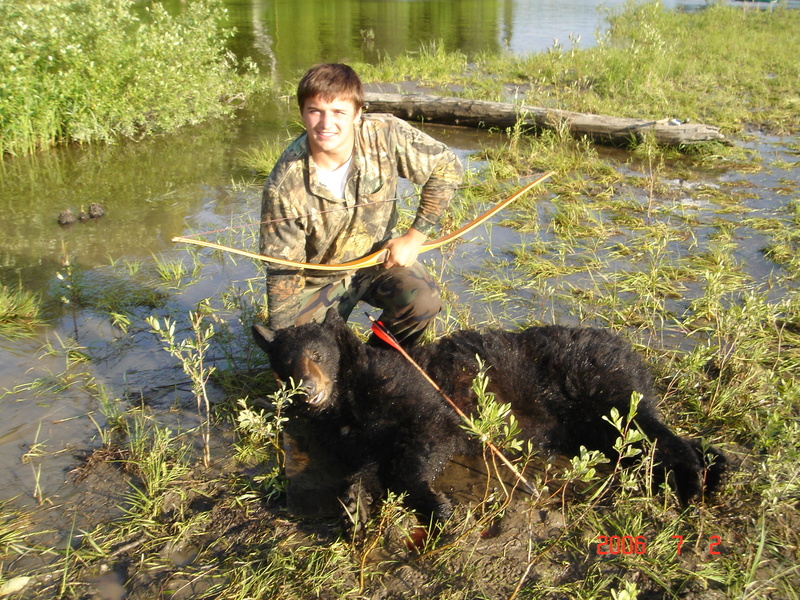 -Harvest a mature black bear with a muzzle loader completeing my longbow, rifle, muzzleoader tri-vector. -Harvest a grizzly bear with selfmade archery equipment, via longbow and wood arrows. 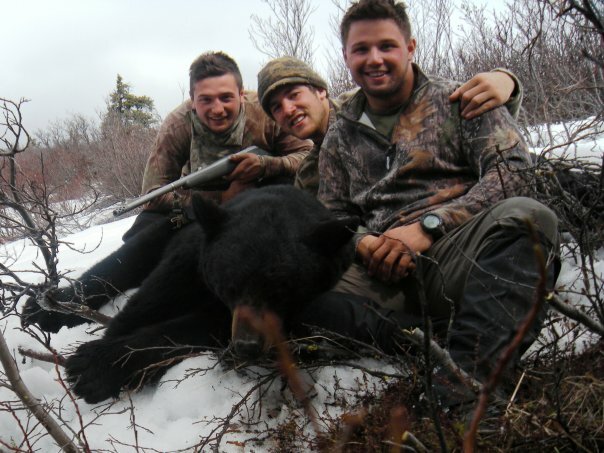 -Personal mission: outdoorsmen goal to harvest a black bear with longbow, muzzleloader, and rifle weaponry. The tactics to hunting these blackbears in areas such as Alaska during spring break up(winter melt of snow), the best tactic to find bears is to research firstly, Alaska department of fish and game. Secondly you must find public areas versus private versus permit, this is easily done with ADF&G Hunting regulations. Thirdly one must know I‘m a resident and have the unique opportunity to hunt Alaska as a Resident and do not need a guide to hunt Grizzly/brown bear, Mountain goats, or Dall sheep. All non-residents must have a guide for those species however do not need a guide for black bear; meaning non-residents still may come to Alaska and develop premium black bear hunting locations without a guide. 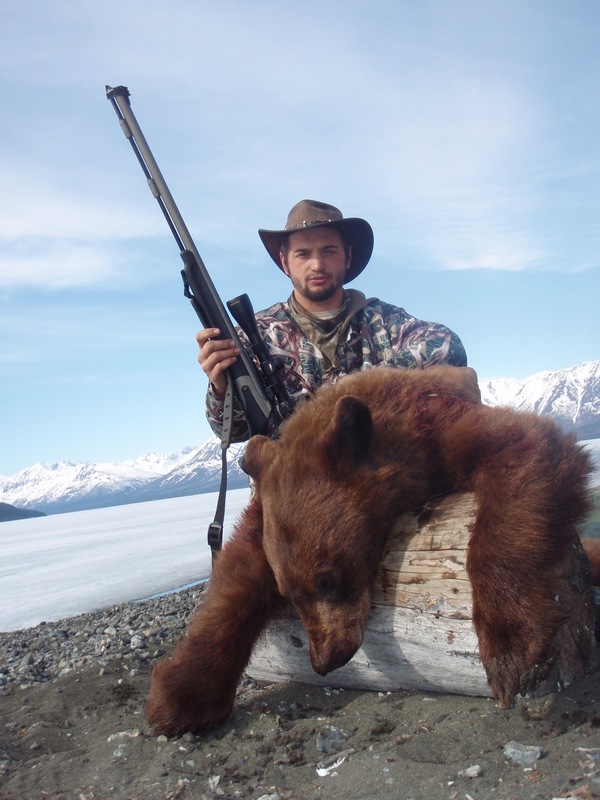 Captain August Manelick joins the hunt to find a “hot bear spot in Alaska”.. Also a Penn State graduate and Alaska resident. The next step finding a map, in today’s day and age the internet offers endless resources to research your hunting locations via birds eye view of the planet(take google earth for example.) www.googleearth.com. Search for South facing cliffs that are exposed to the most amount of sunlight, south facing mountain slopes provide more food to bears via photosynthesis with peak sunlight. Finding the food of these creatures is the key to success this time of year. With the minor details of figuring out where to go, Jon and I headed out as a two man sniper team. The Mission began after our tedious Alaska research finished and completion of our impending senior finals for Penn State University. We caught a flight to Alaska and headed back to my home town of Palmer Alaska where the real adventure would launch from. After hunting hard for a month, literally 30 days in the field without civilization we had succumbed to a very sober reality….No bears, and two blown stalks, both on film. With that in mind, John and I ended the 2010 season with a failed mission and failed objectives. 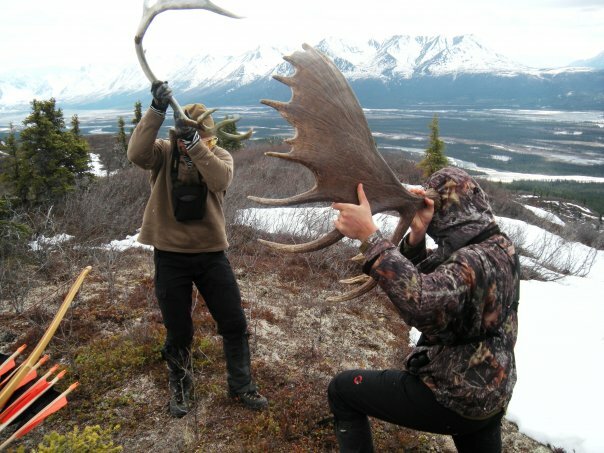 That meant we needed to start researching for the start of the 2011 hunting season in plan for a more successful mission. Several questions came to mind, firstly where would we hunt if we want to develop a premium bear hunting location? We struck out the season before, but had found and hunted two locations that had never been seen to our eyes before and only visited via topographic map. 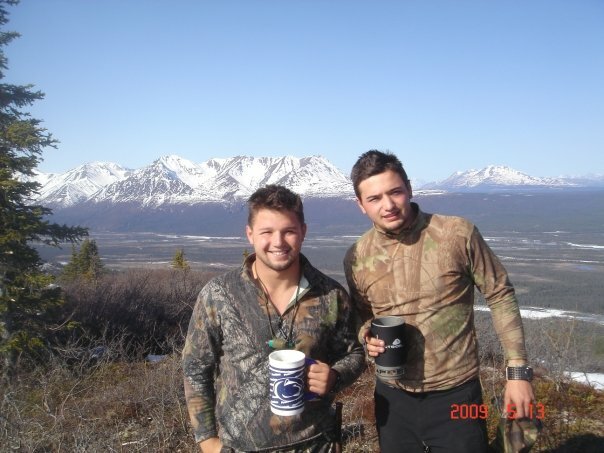 Jon and I, even though unsuccessful in the 2010 season had confidence in our new hunting locations. We also decided that we must hit the bear season earlier and hunt the bears where they were more concentrated on food sources. The key to the 2011 year would be hunting the bears in our Hidden Lake location earlier, on the South facing mountains receiving the most amount of sunlight. We went back to the drawing board and found a different Mountain with exposed mountain faces to sunlight. Hidden Lake, Hidden Mountain was the destination we chose, which in al reality was one mountain away from our a 2010 hunting season location. The adventure began meeting up with Jason Semler, a professional back country snow machining bad boy. Jason Semler a backcountry sledneck, began the backflipping revolution of freestyle snowmachines. Check out this youtube video of him if your not familiar with backcountry snow machining. Being a family friend Jason decided he wanted to accompany the Mission Alaska team and provide the hard ware. He was captain and master of the Atv, Jon and I would be the masters of the mountain and stalks on bears. Jason would be providing video commentary from the beach while Jon and I would go on stalks and give the birds eye view of the stalk with helmet cams, sticks cams, and SD HD Cams. Why not….. We arrived to the destination after a long drive from our headquaters of Palmer Alaska. We began with a 50 mile atv ride with swamp bogs, tundra bogs, frozen creeks, etcs… We finally arrived to our hunting location after a longwinded atv crawl. After setting up camp a base camp, we crawled into our sleeping bags and called it a night. The next morning brought immediate action as we spotted a large bull moose in velvet running across the mountain side. Not long after the moose was spotted, we found out why he was running. A large black bear stepped out in line with the moose upon the mountain side, he was waddling around and was no threat to the moose. We decided to continue to glass the mountain for a couple of hours until we had spotted and noted the area of bears. We spotted a total of four bears across the mountain, two black black bears, and two cinnamon looking bears. We picked the biggest mature looking bear and headed up the mountain after him on a sprint through beetle blow down spruce trees. We slipped up past tree line and were now in the sheep and goat domain. Jon was filming and I was attempting to harvest the bear set out in front of me with either my longbow or muzzle loader. Both legal means of harvest and both deadly. We were stalking across the cliffs that we previously saw a band of dall sheep rams napping and chewing cud. The sheep paid no attention to the bears but were very curious of our dealings and seemingly moved up and over the mountain, leaving us to deal the bears their impending doom. We ended up far above tree line looking down in search for the bear. With the wind in our favor the bear was no where in site, so we sat and waited for him to appear. After several hours of waiting we figured the bear had winded us and had slipped down into the trees. We returned back to base camp, to eat food and countinue glassing for the cinnamonster we stalked earlier. After galssing and meeting up with Jason Semler, he told us we were very close to the bear and he hadn’t moved…………….. We had better understanding of where we needed to be to see the bear and started back up after him. We only had time to eat a Baby Ruth candy bar before we were sprinting up the mountain once again to stalk the bear we had mad an attempt on earlier. Black Bear harvest in 2011 with a TC 50CAL muzzle loader: Third stage a personal mission completed. This time the bear was not so lucky and the second dangerous stalk across the cliffs brought success. The bear was harvested at 50 yards with the muzzle loader after we came face to face with him on a goat cliff. The shot for the TC 50 Cal was fast and effective, smooth and purposeful. The mission was successful, the conclusion was a cinnamon color black bear with a muzzleloader, the tri-fecta was complete. I had completed a life goal to harvest a bear with longbow, rifle, and muzzleloader. After the completion of the black bear tri-vector I still had one objective left, harvesting a grizzly bear with a longbow the beginning of a new chapter. Was this mission a success? My answer is yes, I kept my life, Jon and I captured the harvest on film, and I had my first muzzle loader harvest ever. The only failed objective was to harvest a grizzly or brown bear with my longbow. However, I don’t see the objective as failed, I see the objective as …………. Grizzly Longbow, to be continued. Great article….Looks like you guys are doing big things!